Learn what it was like to be a World War Two fighter ace in this warbird aerobatic flight in a Russian YAK 52. You'll feel the thrill of a full aerobatic routine involving mind-blowing manoeuvres and high g-forces as you loop and roll through the sky on a simulated combat mission. This aerobatic flight will have you airborne for 20 minutes; allowing you to fully experience the YAK 52 military fighter trainer's capabilities. The Yak-52 is a two-seat aircraft first flown in 1976, originally designed as a primary trainer for students who would later transition to Soviet jet aircraft. 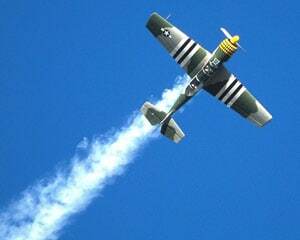 Today it's all about thrilling aerobatics flight fun. Adrenaline is always great to deal with and the experiences they offer such awesome gifts to and from my husband! Very happy with the war bird experience archerfield. I will definitely be back! Was an excellent morning. Very welcoming and helpful. Friendly professional people we met made this a very enjoyable event. Will be back for more! He had a fantastic time. Excellent birthday present. I had a very enjoyable time. It was an experience that is well worth trying. I do some crazy things but this was the most amazing and I describable experience / sensation I have EVER felt. This is one seriously unique experience. Thanks to Cam and the team. See you soon for the jet !!!! My flight experience in the yak52 was amazing. Something I will remember forever! My experience with Adrenalin and Warbird was for 20 minutes but it will last me a lifetime.